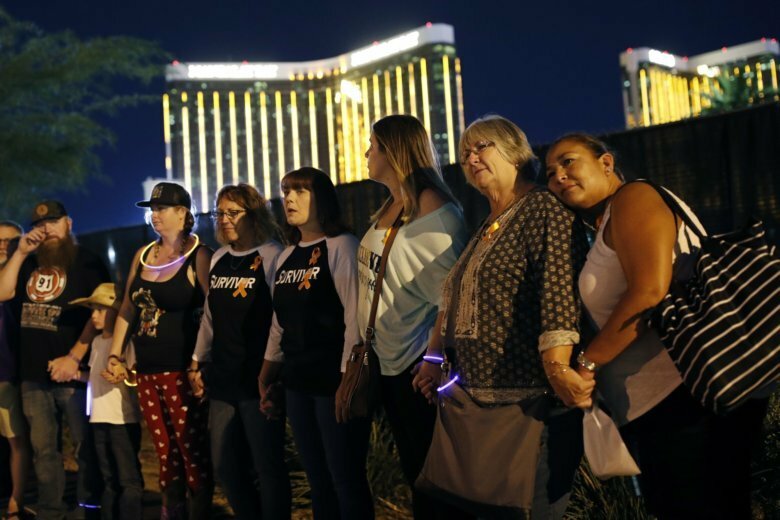 LAS VEGAS (AP) — The marquees on the glimmering Las Vegas Strip dimmed their lights for three minutes Monday night as officials slowly read the 58 names of the people killed one year earlier in the country’s deadliest mass shooting in modern history. The names of the slain were recited before a silent crowd punctuated by sobs shortly after 10:05 p.m., nearly the exact time that a gunman in a tower suite at the Mandalay Bay casino-resort opened fire on the crowd of 22,000. Rick Barnette, whose 34-year-old daughter Carrie was one of those killed, sobbed and looked at the sky Monday as the names were read. He wore a T-shirt with a picture of his daughter on it. The ceremony ended a somber day of events reuniting survivors and the family members of those killed at last year’s country music festival. Jane Matusz of San Diego, who had attended the festival with friends, said memories of the Oct. 1, 2017, shooting returned Monday as she attended memorial events in Las Vegas. Hours earlier, victims’ families, survivors and elected officials marked the anniversary of the tragedy by placing roses on a tribute wall and dedicating a downtown memorial garden. The dedication ceremony under a cloud-streaked orange sunset drew at least 200 people, including former U.S. Rep. Gabby Giffords of Arizona, herself a survivor of a 2011 mass shooting. The garden, which features a tree for each of the 58 victims and an oak that represents life, is the only permanent public space that has been created as a memorial to the shooting. It was built by volunteers and created days after the shooting as the community’s way of reacting to the searing violence, according to the project’s co-creator. “We’ve pushed back with a very deliberate act of compassion,” Jay Pleggenkuhle said. The city known for its gambling and entertainment started the tributes Monday with a sunrise ceremony where a flock of doves were released, with each bird bearing a leg band with the name of one of the 58 people slain. “Today we remember the unforgettable. Today, we comfort the inconsolable,” Nevada Gov. Brian Sandoval told several hundred survivors, families of victims, first-responders and elected officials who gathered at the dawn ceremony at an outdoor amphitheater. The festival venue that became a killing ground has not been used in the year since the shooting. MGM Resorts International, the owner of the property and Mandalay Bay hotel, has not said if or when it will reopen. On Monday night, hundreds of survivors of the shooting formed a human chain around the shuttered site, linking arms and hands to show solidarity. Nearby, a procession of pickup trucks with American flags flying from their truck beds drove the Strip while honking their horns. Many who were cheering Jason Aldean’s headline set on at the Route 91 Harvest Festival late Oct. 1, 2017 , said later they thought the rapid crack-crack-crack they heard was fireworks — until people fell dead, wounded, bleeding. From across Las Vegas Boulevard, a gambler-turned-gunman with what police later called a meticulous plan but an unknown reason fired assault-style rifles for 11 minutes from 32nd-floor windows of the Mandalay Bay hotel into the concert crowd below. Police said he then killed himself. Clark County Sheriff Joe Lombardo declared the police investigation finished in August, issuing a report that said hundreds of interviews and thousands of hours of investigative work could not provide answers to what made Stephen Craig Paddock unleash his hail of gunfire. That has left unanswered the question of why a 64-year-old former accountant, real estate investor, small plane pilot and high-limit video poker player assembled his arsenal and attacked the concert crowd. “Oct. 1 will forever be a day of remembrance, reflection and mourning as we struggle to comprehend the incomprehensible — the senseless act of evil that caused such a tragic loss of life, along with the suffering that we know continues,” Murren said. Associated Press writers Michelle L. Price in Las Vegas and Brady McCombs in Salt Lake City contributed to this report.